SumTotal has been the leading solution in the learning industry for over 30 years and our experience continues to inform our design-driven approach to innovation. We have the most intuitive, modern user experience available today. Your employees expect technology solutions that are engaging, intuitive and match the experiences they have with consumer applications. 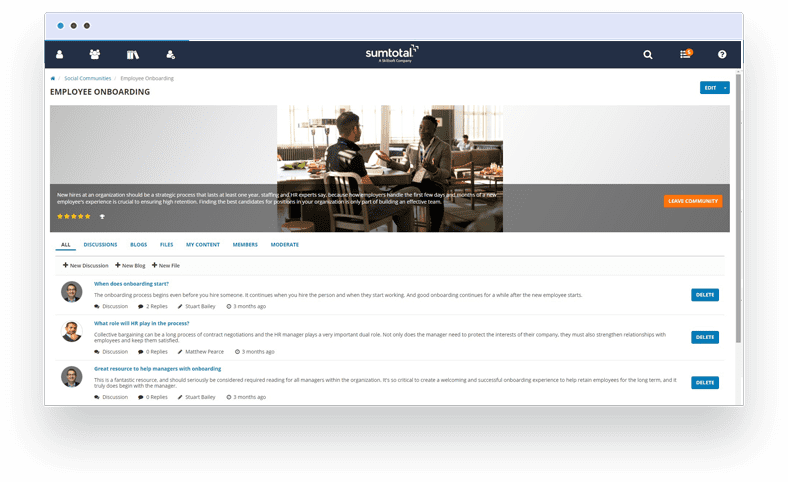 SumTotal delivers a modern, Netflix-style, user experience to deliver learning in a way your employees will use regularly. SumTotal Learning Management takes the most complex learning requirements for organizations and translates them into a powerfully configured learning solution. 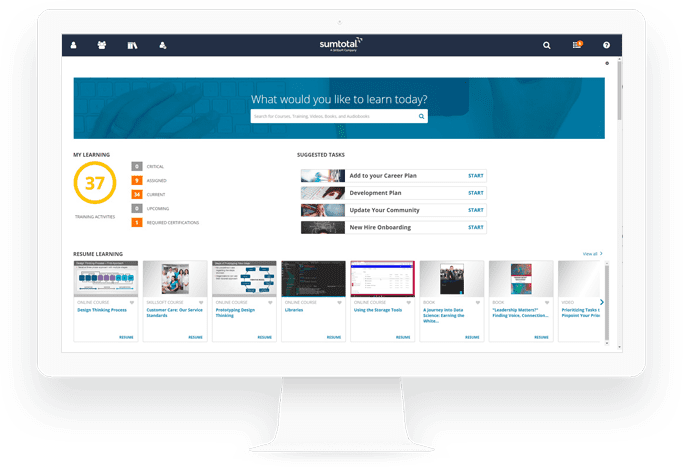 The more diverse your learning needs, the better fit SumTotal Learning Management is for your organization. SumTotal has a long history working with highly regulated, globally distributed and complex enterprise organizations. Let us show you how we can solve your LMS needs. Empower informal learning by giving learners a complete set of social tools and communities-of-practice to collaborate and share knowledge around any topic or activity. 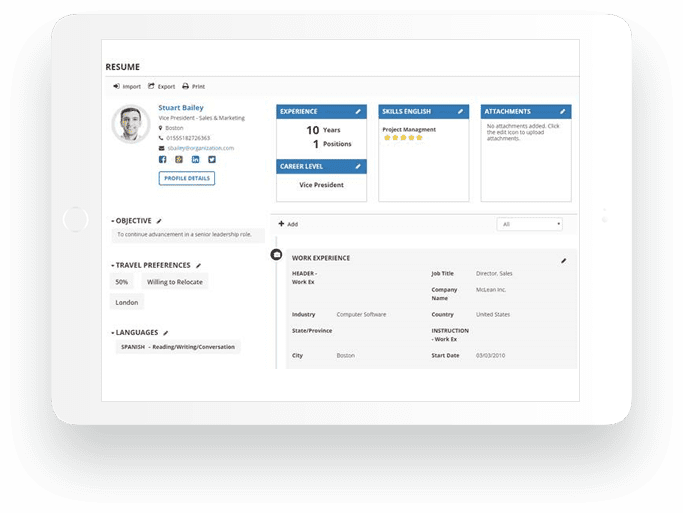 SumTotal offers social ratings and feedback, including tools for agile creation of content by subject matter experts. 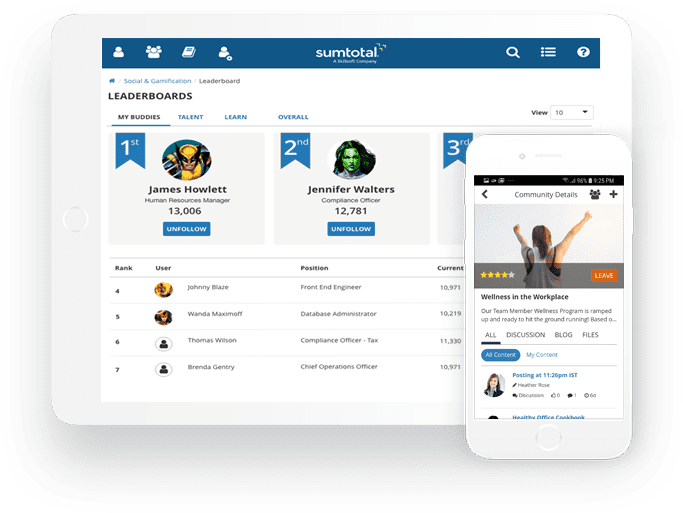 SumTotal’s gamification capabilities, including badges, levels, points and leaderboards, excite your employees and increase engagement by rewarding learning behaviors. TALK TO A SUMTOTAL LEARNING SPECIALIST TODAY! 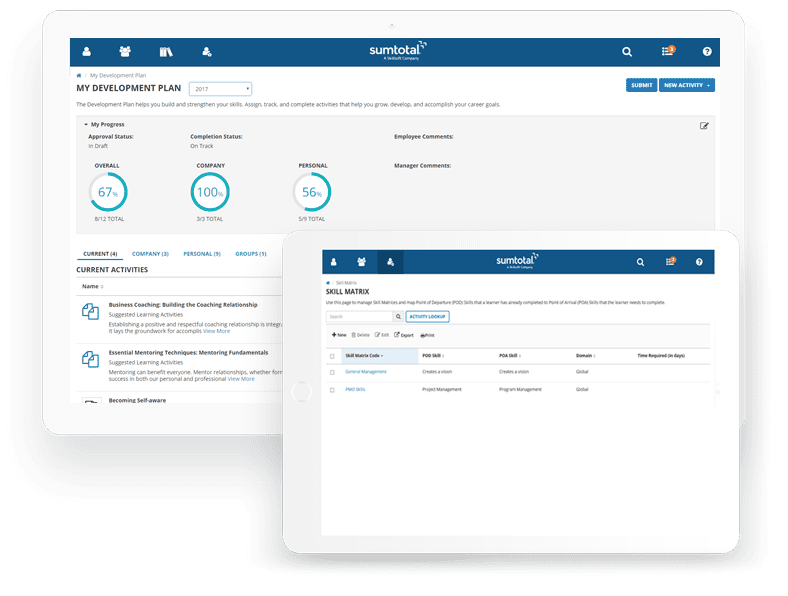 SumTotal Learning Management provides a solution that delivers actionable, meaningful, and accessible learning to help HR deliver on the employee value prop of a culture of learning at your organization. With adaptable learning plans, a visual timeline of priorities and tasks and individualized insight into learning progress, your employees have visibility into the measurable impact of their efforts. We surface learning recommendations, personalized to every individual’s needs and preferences, to keep people engaged in continuous learning effortlessly. Engaging and responsive mobile design and notifications make it easy for every role to participate with the learning they need on-the-go or from remote locations. Whether online or offline, SumTotal ensures learning is prioritized and accessible when and how people prefer to consume it. Observing, curating and evaluating informal learning through an Experience API (xAPI) empowers your people to learn how and where they learn best and become better at their jobs. 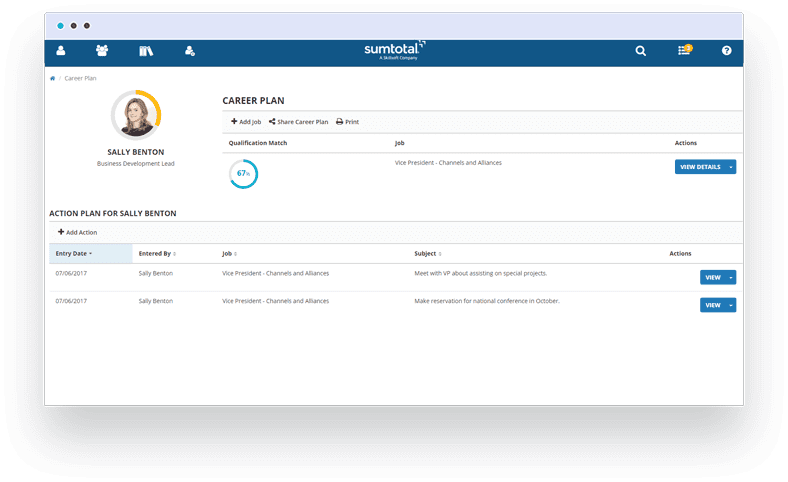 SumTotal’s embedded LRS ensures the LMS can still track and report on learning experiences that occur outside of the LMS. When employees can see and provide input into their career path, they are more likely to stay with your organization. SumTotal enables employees, through our self-service tools, to explore their fit for current and desired jobs by identifying skills, learning and behavior gaps and serving up the precise learning needed to resolve those gaps. Personalized learning recommendations, utilizing machine intelligence, help target growth by suggesting courses and activities based on traditional career paths and actual career path data that is continually mined from peers and predecessors career progression. Development opportunities are one of the biggest levers you have to drive engagement across your workforce. 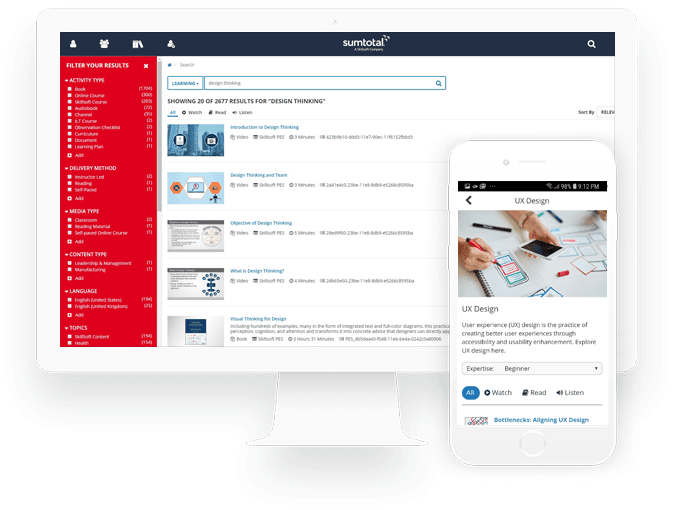 SumTotal Learning Management empowers people with tools that connect learning and curated content to critical development measures like goals, skills, competencies and role expectations. Equip every role in your organization with their own configurable view into the actionable insight and priorities that are most important to them, to ensure actions impact growth. 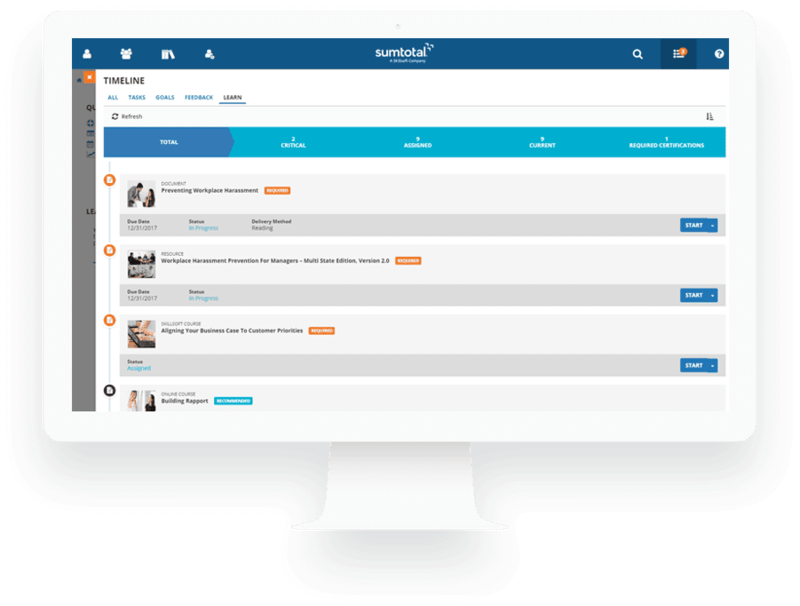 SumTotal’s skill matrix enables your people to see a clear path from one skill to another by understanding where they need to go (Point of Arrival – POA) once they completed a skill (Point of Departure – POD). Make it easy for every role in your organization including individuals, managers and leaders to focus on critical development and learning actions driving productivity and performance. The SumTotal solution takes a holistic approach to optimizing the capabilities of your workforce by unifying information and actions from across the SumTotal HCM suite, even from third-party systems, making access to critical development and people insight more simple, reliable and actionable than you ever thought possible. SumTotal delivers solutions that solve your Talent Acquisition, Learning Management, Talent Management and Workforce Management challenges in a single platform.